The regime that sends its young offenders to the gallows! Hang those Islamic laws and not the young offenders. Here is another young Iranian sentenced to death by the Islamic Republic judiciary and going to face the gallows. Rahim Ahmadi Kamalabadi was 15 when for defending himself comitted the crime and by taking the knife from the victims hand unwantedly and accidentally killing him . He is going to face the gallows in Shiraz city prison. The Islamic Republic of lies & fake degrees ! Human rights organization around the world must take stronger approach against Islamic Republic when human rights violation in Iran becomes a daily routine and systematic. The dramatic scene of religious despotism over defensless people who love to have a peacefull life and freedom,the systematic violation of their human rights and the world particularly the UN for not being able to control and punish the Islamic Republic makes the human rights issues in Iran more like a Comedy -tragic theater. Just a few days ago in UN, Ahmadinejad the president of the Islamic Republic spoke about countries that violate the human rights of others and praised his own regime, as if nothing was happening in his own country against his own people and by his own orders.This shows the availability of the world democratic institutions podium to opprressors and dictators who repeatedly violate the rights of their own people and other nations could become dangerous for misleading the world public. In another instance we see Ahmadinejad seating face to face with Larry King in CNN and lying repeatedly. One thing is clear that, with the help of Iranian exile the world is coming to realize they can no longer trust on Islamic Republic officials. They seat in front of you, looking into your eye and lie. by reading the IRAN WATCH CANADA a tip of the iceberg on violation of human rights comes to your attention. The appeal court of Mahabad city ( in Kurdistan )approved the four year imprisonment of Ms. Zaynab Bayazidi . Her charges: Selecting a Kurdish name for her store ( Zilan) and her activity in the "campaign for one million signature". In a recent Friday prayer the prayer signed a petition demanding the prosecutor of the country to disolve the Bahai organization. Ayatollah Kazemaini Brujerdi was sentence to 11 years imprisonment! With an order by security and intelligent agents of the Islamic Republic , a dissent moslem clergy and his four follower were sentenced to prison term and to internal exile. Ayatollah Kazemaini Brujerdi has been sentenced to 10 years imprisonment in a prison in Yazd city prison. Mr. Alireza Montazersaheb to four years imprisonment in Kermanshah city prison, Mr.Habib Ghovati four years imprisonment to Hamadan city prison and Mr. Majid Alsaty to four years imprisonment to Zanjan city prison. Ayatollah Brujerdi was sentenced in a "court of clergy " a division in the "court of revolution". Recently the security agents tried to force him seat in front of the TV camera to confess and express his regret about his critical views on Islamic Republic. 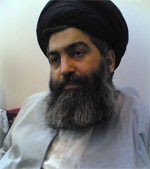 Ayatollah Brujerdi is a clergy critical to the Islamic Republic ruling in Iran . He emphasizes to the separation of religion and politics . After spending two years in prison , he is still under torture and interrogation. The human rights defenders are worried about the deteriorating health condition of this clergy and doctors inside the prison has recomended to the prison officials for his need for treatment in one of the hospital outside the prison. The news that are coming from prison indicate that; the regime is planning to sentence him for 10 years imprisonment and an additional internal exile. Two years ago Ayatollah Kazemain Brujedi was arrested in his home after speaking to a Street gathering.Together with him at least 300 of his follower was also arrested and were sent to prison.Later many of the follower were released from prison but him and 17 of his follower were sentenced to death.This sentencing was later reduced because of international outcry. In addition to 11 years imprisonment to Yazd city prison , the regime has confiscated all of his assets and properties. Press conference organized by HRW in New York on violation of human rights in Iran! This conference is organized because of the presence of Ahmadinejad and the Islamic Republic delegates to the UN annual general assembly , which is taking place this week in New York . "The problem of the western countries with Iran is Nuclear energy and nuclear enrichment and not the human rights violation and this is the difference between us and the western countries and they are not concerned about human rights and democracy." He said: "Their problem with North Korea is the nuclear facilities and not human rights . The same scenario is with Lybia, as soon as Lybia cancelled its nuclear plan the west spoke nothing about the violation of human rights in Lybia." He added: "Iran and US are meeting secretly. we are not against dialogue and these meetings, but it should be open to the public." Union of truck & transport drivers in Ahvaz - Khoranshahr roadway are on strike ! Human rights defenders reported that ; Two weeks has past since the strike of more than 1700 truck and transport drivers because of the negligence by the Islamic Republic regim's about their welfare and regulation of the loads as well as the operation of their union which has been postpond for 14 months. More than 600 truck drivers with a length of 3 km continue their strike in Khoramshahr roadway ( South of Iran). "Iranian hate being in captivity, even if the aggressor invade on their freedom in the name of God and for the God." Kurdish students and human rights activists are on their 25th day of hunger strike! 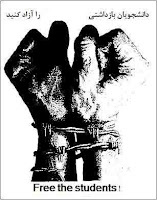 Lets not to forget the Kurdish political prisoners . Particularly , not to forget three Kurdish women's human rights activists who are also in prison and has joined the hunger strike. They are: Ms. Fatemeh Goftari, Ronak Safarzadeh and Hana Abdi . They are in Sanandaj city prison. Human rights NGO's around the world must support the Kurdish human rights activists who are on their 25th days of hunger strike. They have started their hunger strike in the Islamic Republic prisons ( Tehran, Karaj, Sanandaj, Orumieh and Mahabad ) from August 25,2008. According to the news more than 100 political prisoners have joined in this hunger strike. For restricting the news coming from prisons , the Islamic Republic has banned the internet in Kurdish city's. The regime also forced the coffee nets to closure.After a few prisoners told about their hunger strike , the regime totally cut off the telephone conversation between prisoners and their families. The Kurdish political prisoners hunger strike coincide with the mass killing of political prisoners by the Islamic Republic 20 years ago. Two of the Kurdish political prisoners in Sanandaj city prison Mr. Arsalan Oliyaei and Mr. Anvar Hosain Panahi are in bad health and need to be transfered to the hospital.The Islamic Republic has sentenced these two political prisoners to death.These two Kurdish political prisoners also joined their colleagues in hunger strike. In the past 37 political prisoners from this prison (Orumieh city prison ) have announced their hunger strike. Mr. Farhad Vakili who have also joined the hunger strike , in his 12th days of hunger strike he was transfered to the ward number # 209 (solitary confinement) . The report indicate that he is now out of that solitary confinement and the prison officials have transfered him to ward number # 8 in Evin prison. Kurdish student Mr. Khazar Rasul Morovat is a student of literature from the University of Orumieh have been sentenced to three years prison term. Salar Yareh is another student who have been sentenced to six months prison term . Khazar together with his student Mr. Salar Yareh were on their way from their village when the revolutionary guard (Sepahe Pasdaran ) opened fire on them and both were wounded. Khazar was also a teacher of Kurdish language. Association of Human Rights Defenders in Iran has requested the political prisoners to end their hunger strike and stay healthy. More on Kurdish political prisoners in previous post of the IRAN WATCH CANADA. Iranian women fight back to bring changes for women! Imprisoned Kurdish teacher Farzad Kamangar in a photo with his student. At present Farzad is in Ward number 206 of Evin prison and is under interrogation and pressure. There are more than one million teachers in Iran . More than 10 members of the Teachers coordinating council of all over Iran has been arrested! According to the news , a few hours ago security agents has entered into the teachers unio session and has arrested more than 10 teachers coordinating council members. This meeting was called by the teachers union and was held in the house of one of its member and was participated by teachers from different city's.The members arrested were all member of the teachers coordinating council from all over Iran and they were arrested by the plain cloths agents. Mr. Akbari, Mr. Baghani, Mr. Beheshti, Mr. Niknejad, Mr. Zainalzadeh, Mr. Noori, Mr. Qoreishian and Mr. Fallahi. The painful letter of Parham Aghdasi, the Bahai student representative banned from university education! I'm Parham Aghdasi, the past student of the Atomic molecular Physics from Boali Sina University in the city of Hamadan. I have passed the enterance examination to University in 2006-2007 and was able to enter into the University but unfortunately after one term education , before the first term examination , the university officials based on a decree of the cultural revolution and because of my religious belief and as a Bahai , I was expelled from university. They insisted the only way to admit me into the university is to change my religious belief from Bahai to Islam . Appointed Ahmadinejad's team of managers clearing the government media from independent minded journalists! Ahmadinejad's government continue its attack on journalists ! Is this a policy which has been dictated to Ahmadinejad government by the expediency council or it is the arbiterary decision of the Ahmadinejad and his circle. According to the news the government of Ahmadinejad has appointed managers for the news agency's like IRNA and Iran newspaper ( these are pro government agency's ) . These managers has started a new round of layoff and early retirement of journalists who are critical to the government of Ahmadinejad. So far IRNA has changed its managers for three times and in less than six months all the past managers of this news agency has been removed from their post. One of the journalist emphasized: With the order of new managers in IRNA all the people who were working in IRNA as managers or had sensitive post in IRAN have time until end of September to retire ( early retirement). Last Week the file of at least 18 official personel of the IRNA (News Agency) was sent to the human resources to finalize their early retirement. Some of the journalists and managing editors in protest to this trend of expulsion , layoff, and forced early retirement has created a blog to speak about their situation. According to Ahmad Jalali Farahani one of the oldest working journalist In Iran Newspaper 59 journalists have been either expelled ,resigned or discussed on pakages for early retirement. Latest news indicate that during the presence of Ahmadinejad in the United Nation in near future; Mr. Ahmad Batebi the student who held a bloody T-shirt in his hand during the student protest in early reform period will also be present as a reporter. He will be revealing the violation of human rights in Iran by the worse government of the world (the unpopular government of Ahmadinejad). 12 journalists and Azarbayjani national activists are arrested! With an attack to a house in Tehran by the security agents of the Islamic Republic, 18 men, women and childeren who were advocating the culture and language of Azarbayjan are arrested. 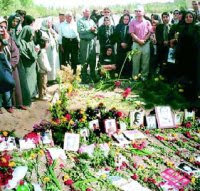 This attack took place on last Wednesday September 10,2008 and until now six women and childeren are released but according to a report by the human rights defenders the rest of the people are transfered to the ward number 209 of the Evin prison. According to the report by the human rights defenders the people who are arrested are journalists and human rights activists in Azarbayjan. These people are transfered to the ward number 209 of the Evin prison. do you know what happened on last Wednesday? An Iranian women from Northern Iran weaving "wrapper for bedclothes ". 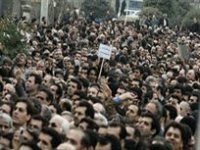 Islamic Republic regime in Iran is afraid of people's uprising? In recent years if closely looking at the situation in Iran , one can easily understand that the Islamic Republic is unable or can no longer continue to suppress the "movement for human rights and democracy " as in its early political lifetime. Looking at the situation , reading between the line , reading their lips and body language, all shows that they have become scared of Ahmadinejad's continuous suppression of the student movement, women's movement, workers movement, teachers movement and minorities demand for human rights . They are always cautious it might backfire. One thing is clear , that despite of Khamenei's support for Ahmadinejad government he is not going to be elected again as the president of Iran in the next election. The failure of the government to pass its recent bill for families in the legislature, the release of three students of Amirkabir University from prison , the changes in Zanjan University ,the reaction against the employers in Alborz Tire factory in Islamshahr , the disaproval of more than 10 cabinet minister of Ahmadinejad's cabinet , the forged degrees of the universities in Iran and around the world by the Islamic Republic officials, and many many more weaknesses shows that the Iranian people are in a crucial moment in their decision making for expanding their movement for " human rights and democracy " . Islamic Republic is in the list of top five countries for killing its people. Islamic Republic rank 2nd in the world for sending its teenagers to the gallows. Islamic Republic for Its financial and moral support of Hezbullah, Hamas , Sader and many other radical Islamists. families fear for their childeren's security; particularly their teenage and young daughters. There are so many factors which shows that the Islamic Republic is taking one step backward. In the last three years Ahmadinejad government was on the offenssive and still trying to do so. But that fear of backfire !? Iranian people know what they must do , and when. 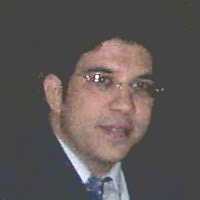 Emad Baghi a human rights defender spent close to a year in prison and is still in prison! What about the secret relation between the 12th Imam and the Islamic Republic's officials? A 17 year old boy claimed that he has connection with the 12th Shiite imam ( Imam Mehdi) who is absent. The Shiiet moslem beleive that ; the 12th imam will appear when the world is in crisis. After claiming and speaking in a mosque for a gathering he was picked up by the security agent for questioning. Another man from Mazanderan province also claimed that he has secret relation with 12th Imam. He said : he has secret relation with 12th Imam since he was 25 years old. The regime arrested these people and called them as impostors. Mahmoud Ahmadinejad the president of the Islamic Republic also believe that he has secret connection with the 12th Imam. Why Ahmadinejad and other Ayatollah's in the city of Qom who claime have secret relation with 12th Imam weren't picked up for questioning . Iranian Kartoonist Nik Kowsar on Kordan's honorary degree. To take the enterance examination or to go for a forged degree. Finally the degree itself , has signature which the Oxford University claime is forged. 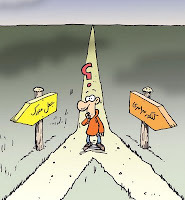 Recently this issue become the talk of the people in Iran. They believe most of the Islamic Republic officials have forged degrees from universities in Iran and around the world . Oxford University's reaction towards Mr. Kordan's honorary doctorate degree:We are looking into Mr. Kordan's claime. 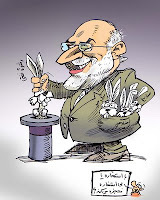 Mr. Kordan was recently appointed by Ahmadinejad as one of his cabinet minister. He was chosen as Interior Minister. Mr. Kordan for show off claimed that he has an honorary doctorate degree from Oxford, which later was found that he had a forged degree from Oxford University. According to the news other ministers and officials in the Islamic Republic also have forged degree. In the past , Oxford University announced that; they do not have the name of Mr. Kordan as one of their honorary graduate . However, the Oxford University said that; If Mr. Kordan and his lawyer continue to claime and sent a request , the university will look into the matter. Zhila Baniyaqub , the journalist has been interrogated by the office of the assistant to the public prosecutor on security; a division of the court of revolution ! The feminism school has reported that; Zhila Baniyaqub the journalist has been interrogated today by the assistant public prosecutor on security . She has been allegedly accused of " public disturbance and disobedience to the police order " . Ms. Baniyaqub with a written summons in hand; which she had recieved a few days ago; attended in the office of the assistant to the public prosecutor on security, a division of the court of revolution and said : "All the accusation are lies and in her defence document she wrote; unfortunately the police and security officials are easily telling lies and the police who's duty is to keep the security in the society , but by arbiterary arrests disrupts the peace and security. instead of me or the women's rights activists to stand on trial, the police forces who have illegaly beaten Mr. Keyvan Samimi the writer and eight women activists from the women movement in front of the (gallery of the silk road) must stand on trial." The interrogation took place by Mr. Sobhani the assistant prosector. Mr. Sobhani prevented Ms. Baniyaqub's lawyer Ms. Mina Jafari to be present at interrogation . Zhila Baniyaqub is one of the hard working journalist and writer in today's Iran. Zhila Together with her husband Mr. Bahman Amoei who is also a journalist are widely known and respected among Iranian journalists. journalists or release them immediately. Muchashi, "You have crossed the red lines," one of them told CPJ. of America, Radio Farda, BBC Persian, and Deutsche Welle. to either charge or release them immediately." entitled to a lawyer until they are formally charged. international news agencies in the last 10 years." leader by Iranian agents in Germany in 1989. The information contained in this alert is the sole responsibility of CPJ. In citing this material for broadcast or publication, please credit CPJ. Road to The Revolution", may be the motive behind this decision. Watch this video - survived political prisoners speak on their experience. Kurdish political prisoners are on hunger strike in the Islamic Reopublic regime's prisons! 10 days has past since the start of their hunger strike. During this 10 days many Kurdish political prisoners from Tehran, Sanandaj, Orumieh, Mahabad , Saghez and ....has joind to this strike. More than hundered has joined to this hunger strike. Islamic Republic in the past has executed father Hussain Sudmand because of his belief on Christianity and now arrested his son Mr. Ramtin Sudmand! A catholic Iranian has been detained by the Ministry of Information! Mr. Ramtin Sudmand is an Iranian catholic picked by the agents of the Ministry of Information 12 days ago and is still in prison.12 days after his arrest, his family does not know what the charges are against their loved one. Ramtin himself a prist was arrested by the agents on Monday September 1, 2008. The family can't hire any lawyer because of intimidation by the Ministry of Information. It is needed to say that; "father Hussain Sudmand" the father of Ramtin has been executed in Mashhad city prison on December 3, 1990. He was executed because he didn't want to deny his belief on christianity. Later when the case of the father was followed by his wife; the regime admit making mistake on sentencing and as a result of that; the regime said it is ready to pay the blood money (Diyeh)to the family. Women's rights is human rights! Widespread arrest of the Azarbayjani student activists in Iran. Islamic Republic's hostilitiy with the human rights and civil rights advocate in all over Iran is a clear indication that first of all; the movement for human rights and democracy in Iran is strong and 2nd; the Islamic Republic regime in Iran is the enemy of the civil society in Iran. When you see there is an innocent and the gallows ! These are members of the "Association of the Voice of Justice of Sistan & Bluchestan" who are in prison without any trial. One day the Islamic Republic regime will send them to execution machine.